After planning, designing, and installing the EasyClosets custom closet system, we are ready to reveal how the new set up is working for us. 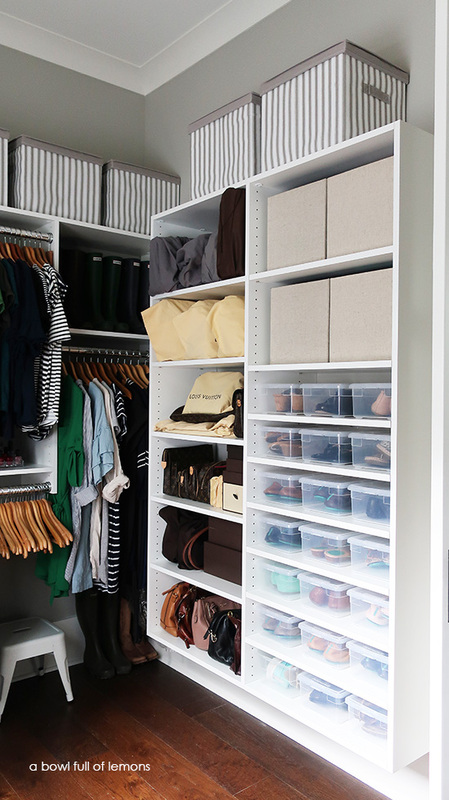 Before you go any further, be sure to check out our closet design plan and installation here. I also shared the tour on YouTube. Check it out >>here <<. 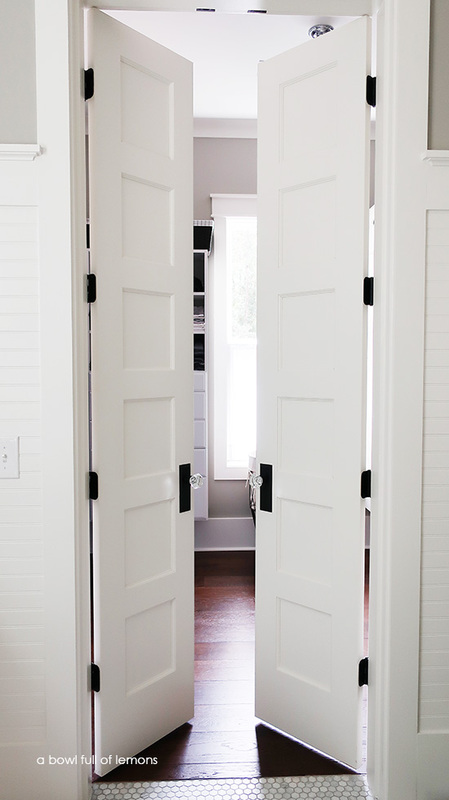 As you walk into our closet, you will see we have created “his and her” sides. My things are on the right side and my husband’s items are on the left. 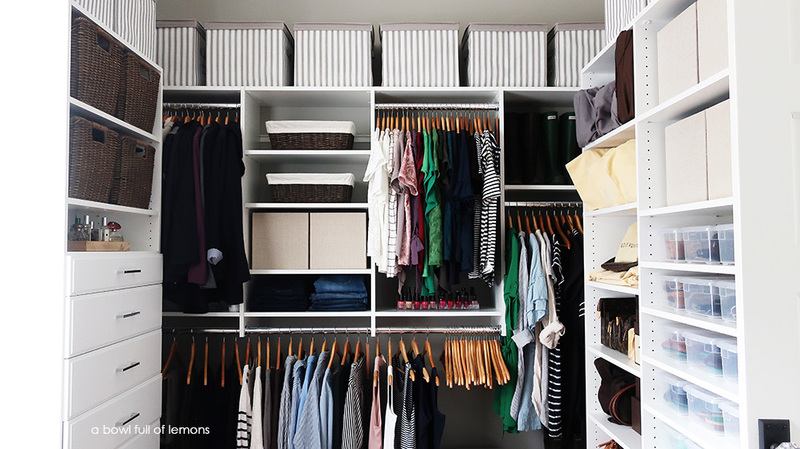 The EasyClosets system has brought an atmosphere of order and simplicity to our space and we love every inch of it. I designed a shelving unit for my handbag collection. It allows me to find what I’m looking for quickly. 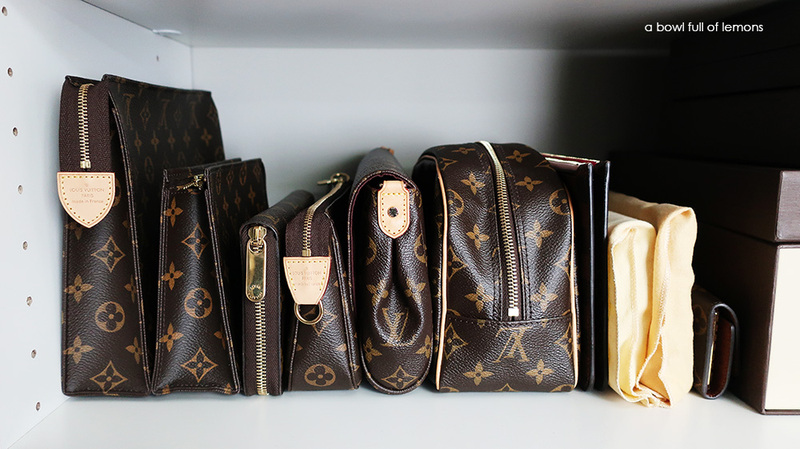 I change out my handbags and accessories often, so this space is important to me. 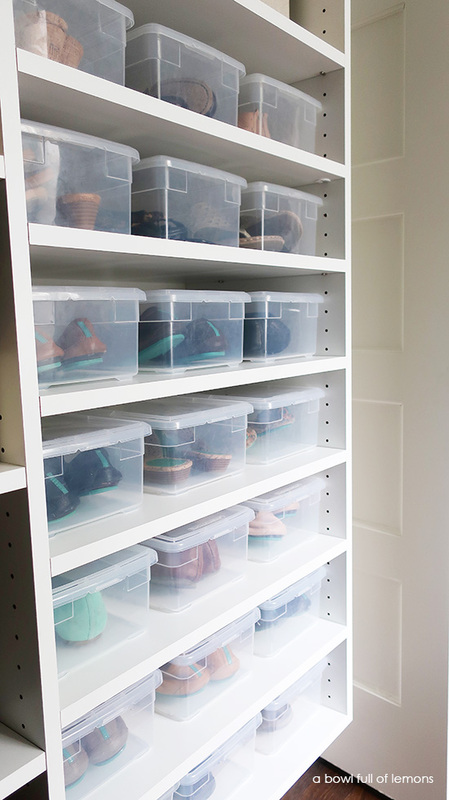 I love that the EasyClosets shelves are adjustable, allowing narrow spacing for the shoe boxes. I prefer clear shoe boxes like these. 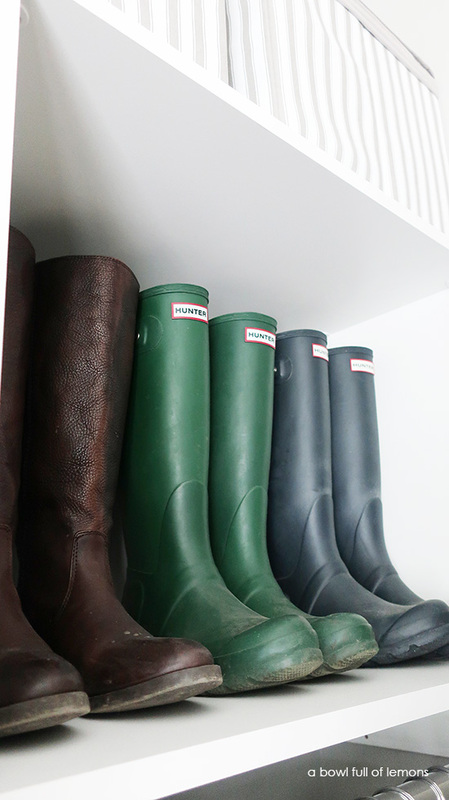 I store my boots on the shelf above the dresses. It’s the perfect height for them. In the middle shelves of the closet are bins and my jeans. I keep wallets and mani/pedi items in the bins. I have several sections for hanging clothes. 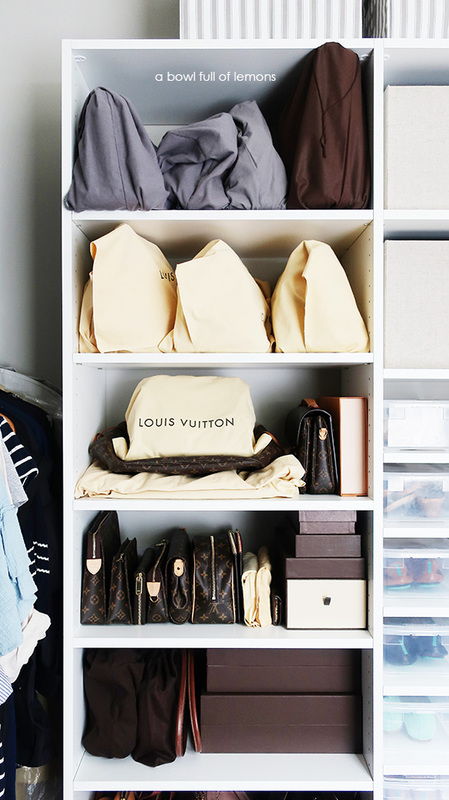 I have dedicated spaces to keep my shirts, dresses, and skirts organized by style and season. I prefer these wooden hangers for their quality and aesthetics. I store out of season items on the top shelf, in these cloth bins. 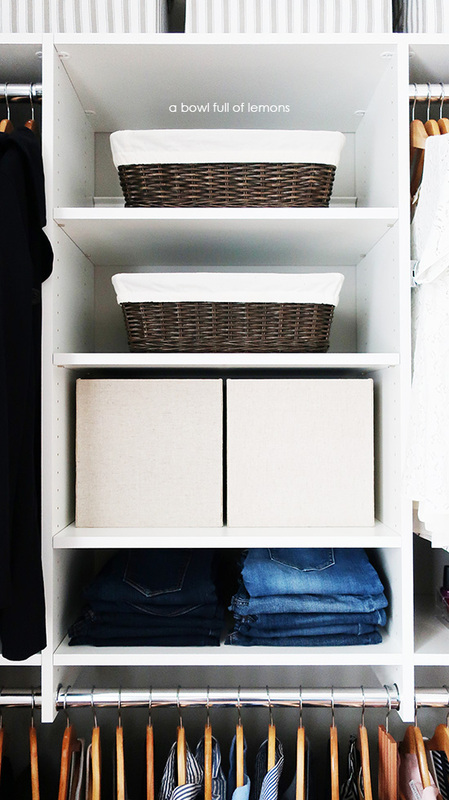 The top shelf and hanging rods go all the way to the side closet wall, which lets me utilize the corner storage space. 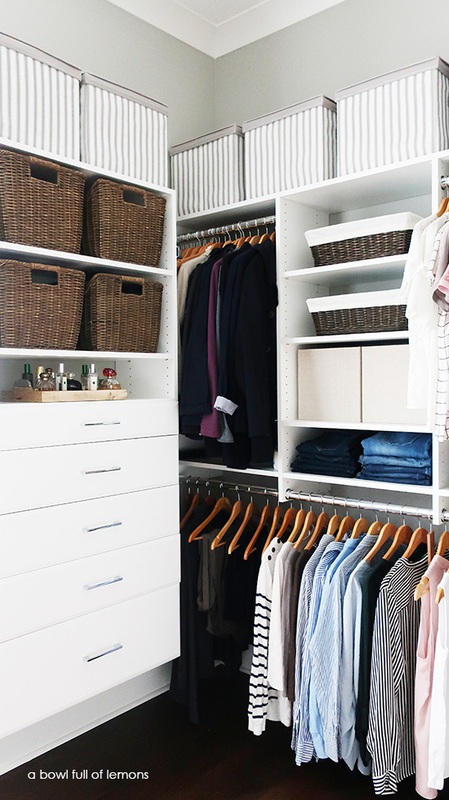 We designed our master closet with lots of drawers to create custom dressers, so we can have more available space in our bedroom. 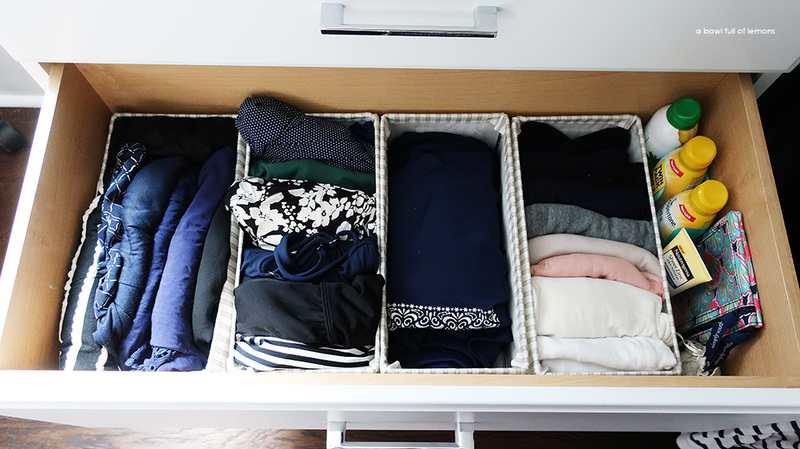 The full-extension drawer glides make it easy to reach everything stored inside. This is how I organize my summer swimsuit drawer. 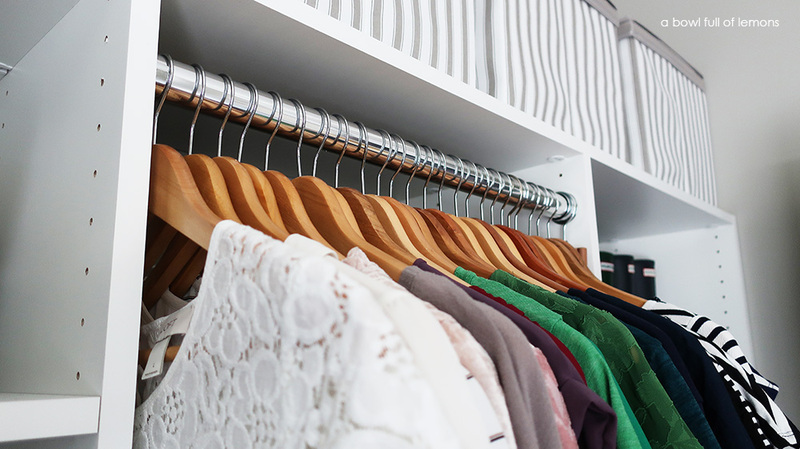 EasyClosets has great custom options and accessories for their closet systems. 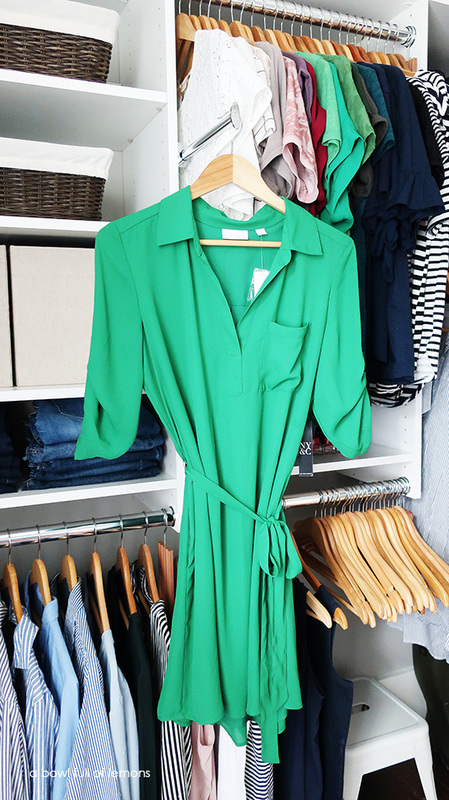 We installed a valet pole, which is great for hanging your outfit of the day (the night before). Here is my husband’s side of the closet. He is just as organized as me. 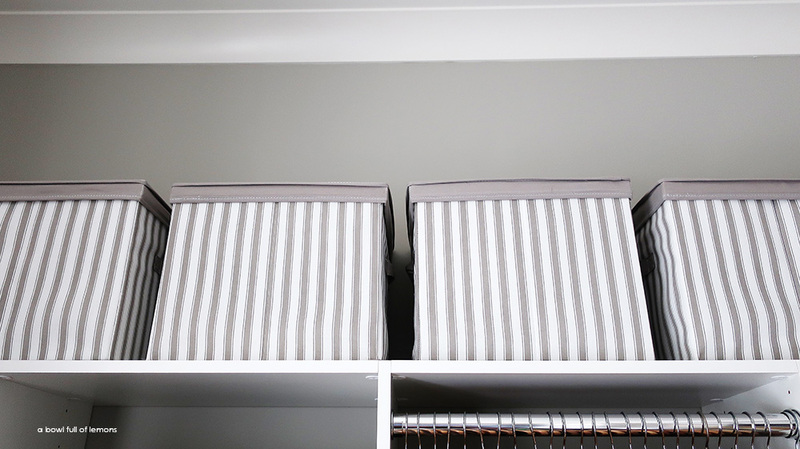 We were able to maximize the storage space with double hanging rods. 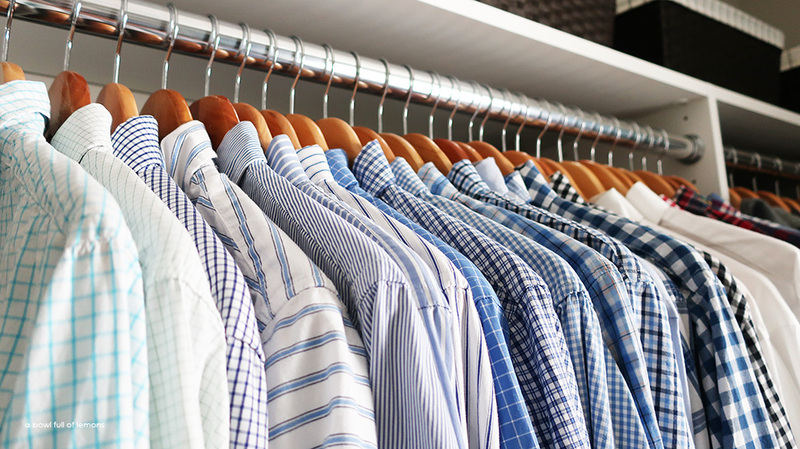 His dress shirts are nicely hung on the wooden hangers. 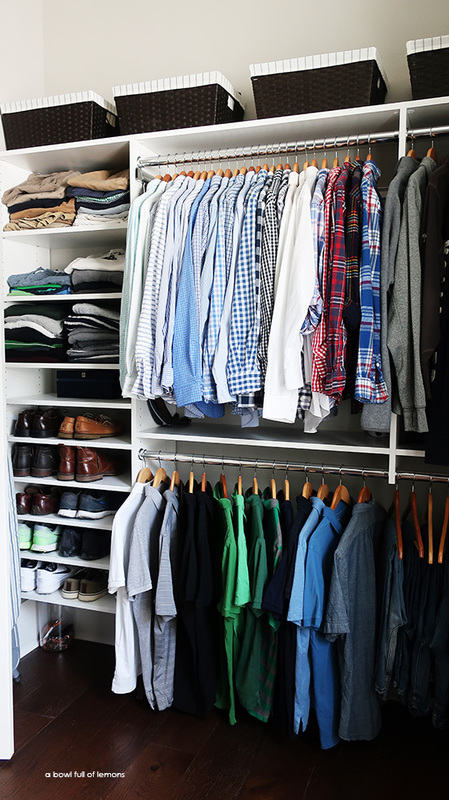 His ties are hanging on the EasyClosets slide-out tie rack. 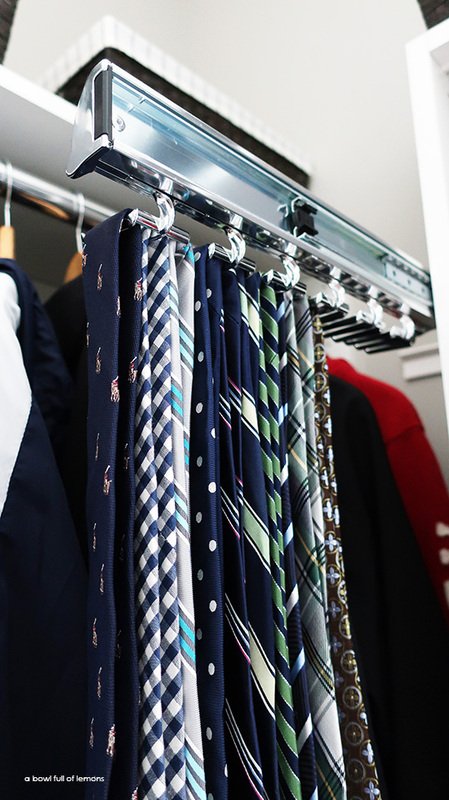 It will help keep all his ties organized in one place and wrinkle-free. 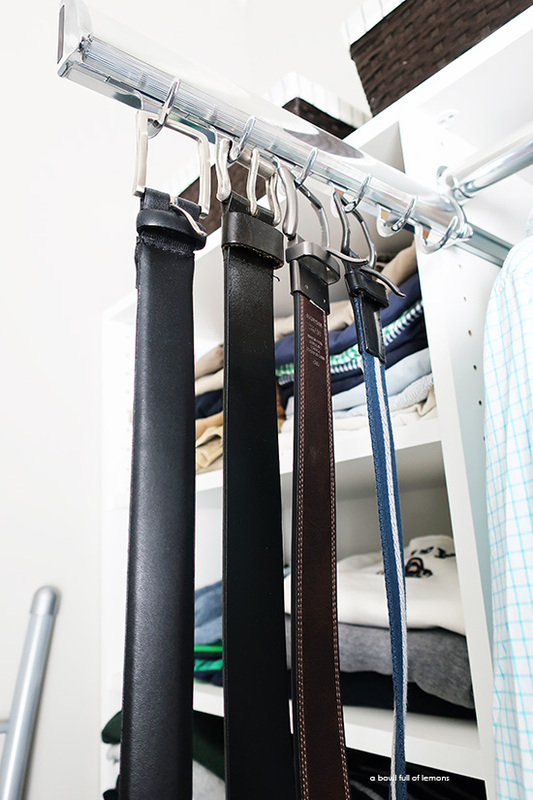 And his belts are on the pull-out belt organizer. 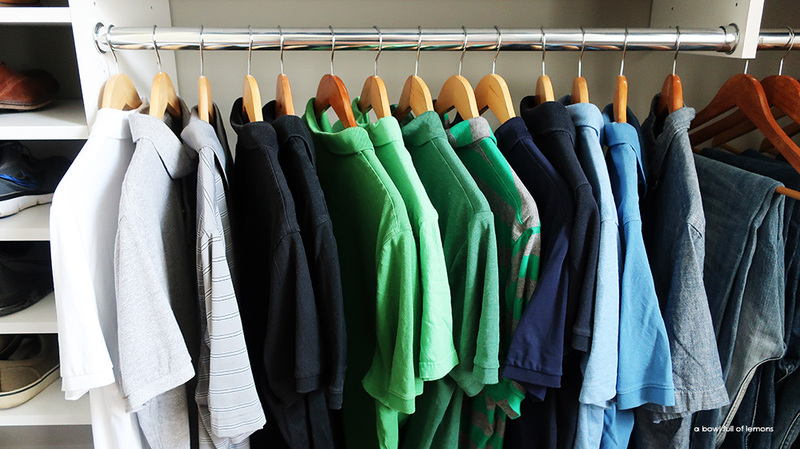 His polo shirts are color coordinated neatly on hangers. 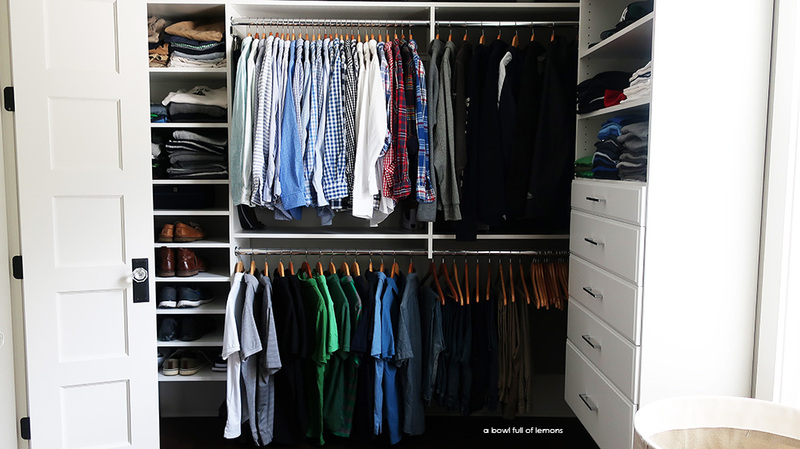 Finally, his shorts, sweaters, and shoes are stored on the left side of the closet. He also keeps out of season things in the baskets on the top shelf. EasyClosets has been a wonderful addition to our new home. The closet system has brought order to the chaos of moving. 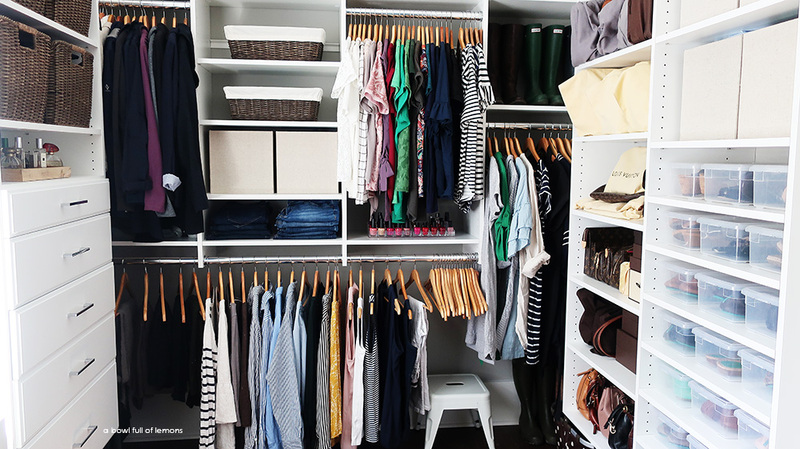 If you are looking to update your master closet, be sure to check out EasyClosets.